The multiple-ligament injured knee (MLIK) includes a variety of severe injuries, in which at least two major knee ligaments are disrupted. Recommended treatment of each type of MLIK generally consists of reconstruction of all injured ligaments, which can successfully restore knee stability and function. Recently, arthroscopic primary repair has been increasingly performed in patients with either proximally or distally avulsed cruciate ligaments. In this selected group, the ligaments are arthroscopically reattached to their anatomical footprint. By using primary repair, native tissues are preserved, which maintains proprioceptive function and avoids graft harvesting with subsequent tunnel drilling, which ultimately could hasten recovery, reduce postoperative arthrofibrosis, and minimize the long-term risk of osteoarthritis. 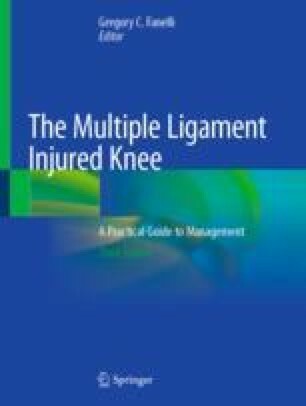 In this chapter, we discuss the (I) indications for primary repair in the MLIK, (II) surgical technique of primary repair of major knee ligaments, (III) postoperative management, (IV) historical and recent results of primary repair in the MLIK, and (V) two case examples.